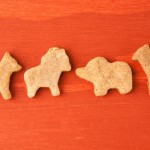 These animal crackers make a great take along snack for any age! Preheat oven to 325F and line a baking sheet with parchment paper or a silicon baking mat. In a larger bowl, combine wet ingredients and beat with a hand blender until well mixed. Add water, 1 tablespoon at a time, until the dough pulls away from the sides and forms a large ball. The dough should stick together and have a thickness of pie crust. Place the dough on a floured surface (I used extra rice flour) and roll out the dough until it’s 1/4-inch thick. 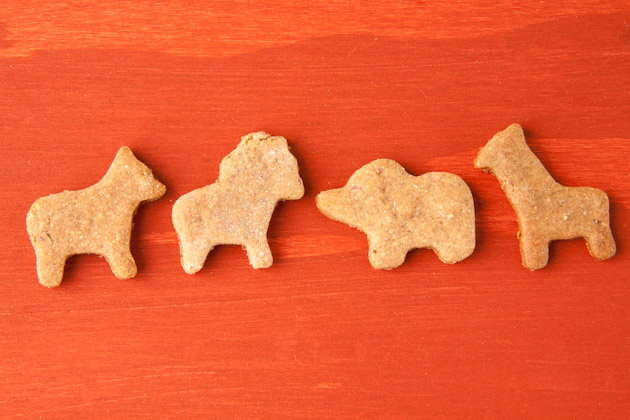 Use animal shaped cut outs to make small animal crackers. I used these ones. Place each cut out on the prepared baking sheet leaving sliver in between each cracker. Bake for 10-15 minutes, depending on desired crispness. They are cracker-like at 15 minutes and slightly chewy at 12 minutes. My favorite was 15. Remove from oven and allow to cool completely to firm up. You could probably use buckwheat or brown rice flour to replace the teff flour if it’s challenging to find. If coconut sugar is difficult to get, try replacing with brown sugar or sucanat sugar.